This vegan peanut butter cup protein shake is a little sweet and a touch salty, just like a chocolate peanut butter cup. 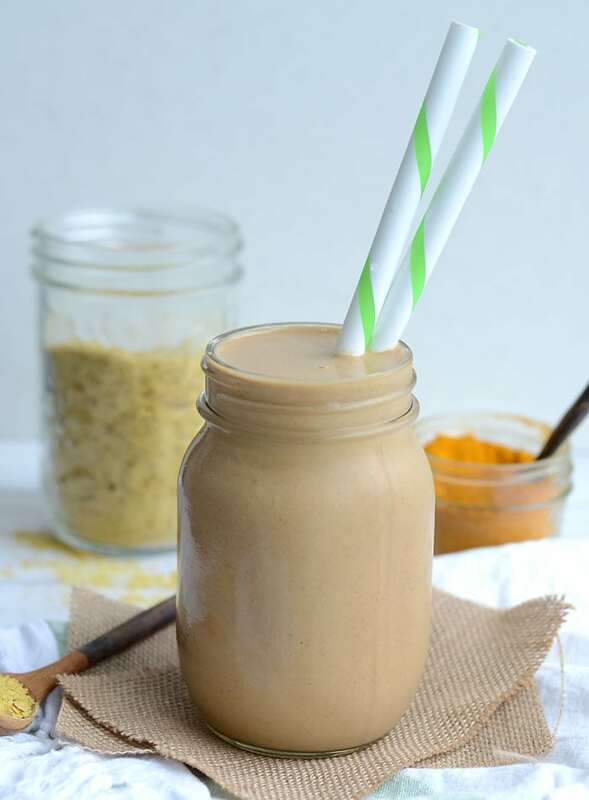 The recipe is made with nutritional yeast, almond milk, frozen banana, peanut butter, chocolate protein powder and turmeric for a high-protein vegan shake that tastes like dessert. Enjoy it for a vegan breakfast or post-workout snack. I think it’s essential to either take some form of B12 supplement or make sure you’re eating plenty of B12 fortified foods. Vitamin B12 can be harder to get if you eat plant-based but it’s no problem if you’re conscious of including it in your diet. I supplement with B12 and try to eat lots of B12 fortified foods. Nutritional yeast and store-bought nut milk are two of those foods and this recipe has both of them. You can read more about B12 and other nutrient considerations in my vegan nutrition guide. If you have more questions about protein in a plant-based diet, check out my post on the best vegan protein sources. Nutritional Yeast In A Protein Shake? You might think it’s a little odd to add nutritional yeast to a smoothie but trust me on this one. 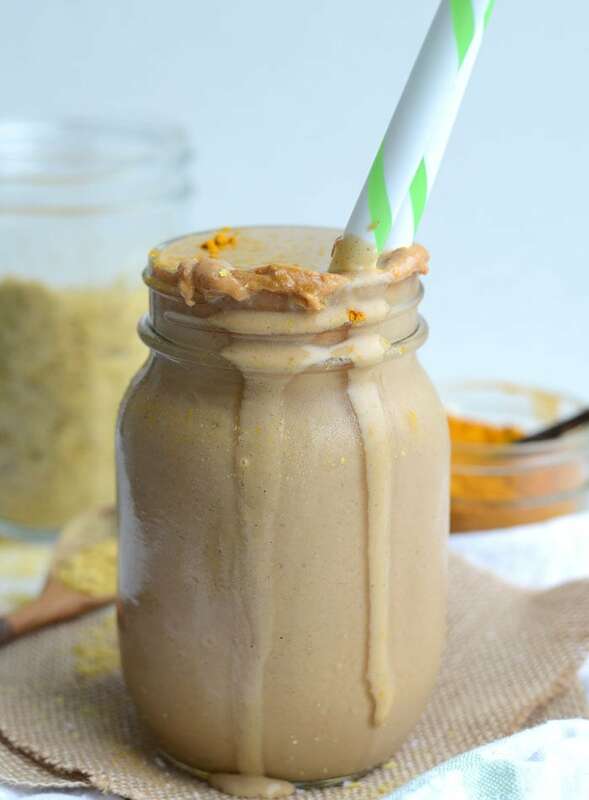 Nutritional yeast is the key to peanut butter cup protein shake success! Not only does it add the perfect nutty, salty flavor to this smoothie, it adds extra protein and B12. Nutritional yeast is a staple in my kitchen. I add it to a ton of recipes as well as sprinkle it on popcorn, top salads with it and use it to make dressings and sauces. Nutritional yeast is also known to support a healthy immune system, promote healthy skin, hair and nails, improve digestion and is a complete source of protein. You can read more about nutritional yeast and how to use it here. 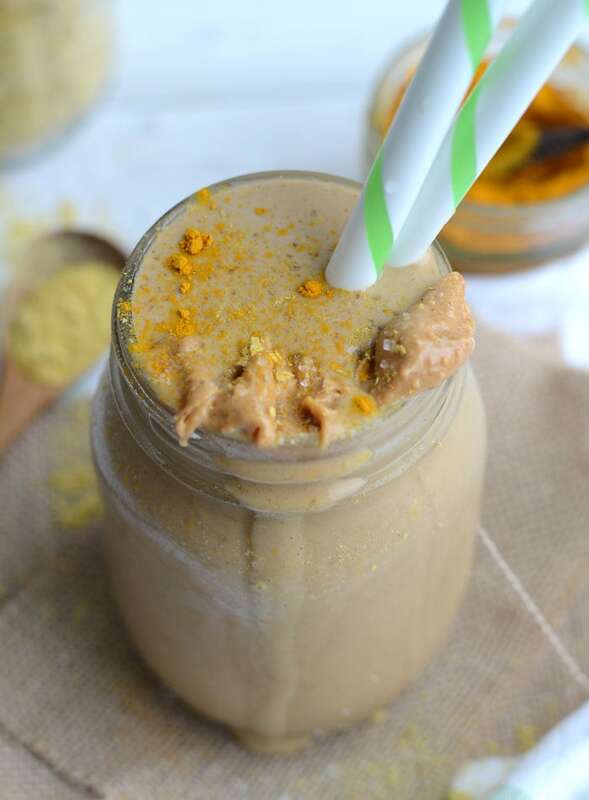 Turmeric in a peanut butter cup smoothie? Yes, yes it’s true! Turmeric is high antioxidants, has anti-inflammatory properties, has been linked to brain health, reduces the risk of heart disease along with a number other health benefits. I use it in this recipe to add some color as well as for it’s nutritional properties. You can’t taste it once it’s blended into the smoothie and while it’s an optional ingredient, I’d definitely recommend sneaking it in there! For another amazing turmeric drink, you’ve gotta try my turmeric golden milk. It’s delicious and such an easy way to include turmeric in your diet more often. There are two ways to eat this amazing peanut butter cup shake. 1. Add about 1/2 a cup of almond milk so it’s thick and creamy like peanut butter cup ice cream. Eat it with a spoon. 2. Add about 3/4 to 1 cup of almond milk so it’s creamy and decadent. Drink it with a straw. I usually make it a bit thinner so there’s more of it, then still eat it with a spoon. I love making my protein shakes into smoothie bowls and digging into them with a spoon. Smoothie bowls are also the perfect vessel for peanut butter cup toppings! Ahem, chopped up vegan chocolate peanut cups. However, If I’m taking it on the road, I’ll add a bit more liquid so it’s drinkable. Both ways are crazy delicious. Frozen bananas are the key to the creamiest, thickest, most amazing smoothies. I always make sure to have a container of frozen bananas on hand. I buy extra bananas each week so my freezer is always stocked Just make sure you peel them before freezing. Don’t skip the frozen banana in this recipe for best results. I’m in love with this smoothie! The flavour is seriously so amazing, just like a Reese Peanut Butter Cup! You only need a few simple ingredients to make it. Toss ’em all in a blender, blend until ultra-smooth and creamy. Drink it all up. You won’t regret it. In fact, you’ll be drinking this one on repeat. That’s a promise. I also have an amazing e-book featuring 66 protein smoothie recipes plus everything you need to know about creating healthy, delicious smoothies. Click here for more information. This peanut butter protein shake tastes like a chocolate peanut butter cup! Try it for a high-protein post-workout snack. I usually have a smoothie every morning so I love finding new recipes to mix it up a bit. Thanks for the post–I look forward to trying this! Wow, I never would have thought to add nutritional yeast to a smoothie – great idea! I have mixed thoughts on supplementation, which I talk a lot about – I believe that the “best case scenario” is to get all your nutrients from real food, as most people do. However, I also believe that most people (even those of us who care a lot about our nutritional balance) don’t eat a “perfect” diet and have some nutritional voids. So, in general, I’m pro-supplementation to have your bases covered. Like almost anything, it depends on the individual, though! I am not vegan/vegetarian, but I am anaphylactic to dairy, chamomile, & walnuts, allergic to soy, oats, coffee, & melons, and have celiac, asthma, and adrenal fatigue. I eat a mostly whole foods, very very little grain and sugar free diet. Per my doctor after blood work, I am taking a whole food prenatal (b/c they seem to be better absorbed/utilized for me), calcium/magnesium/zinc, B complex, potassium (the albuterol & other asthma meds deplete my potassium very quickly), vitamin D, cod liver oil, dessicated liver, and iron. I’m also trying a tumeric supplement for joint pain, and so far it seems to be helping. 😀 I really love the look of this recipe, and will be trying it soon! We use nutritional yeast often in/on foods for my daughter (celiac/asthma/23 food allergies). Hmmm, interesting! It sounds like you have a lot to think about, but seems like you’re making it work! I’m very lucky with no allergies or intolerances whatsoever. After looking at my diet more carefully I don’t think I have low iron, unless I’m not absorbing it…but I did decide to add a B50 complex vitamin and a multi-vitamin. I’ve heard a lot of good things about turmeric and joint pain, so glad to hear it’s helping. Let me know how you like the smoothie! Fatigue?…Vitamin D! I was feeling very lethargic once I went from vegetarian to vegan. Started a 1500 iu vitamin d supplement. Energy went right up within a few days. Hmm, thanks for the tip! I ended up adding a B50 and multi vit just to be sure. I’ve also just been paying closer attention to my diet and making sure I’m getting enough variety. I love smoothies with peanut butter! Thanks this looks awesome I have to try! 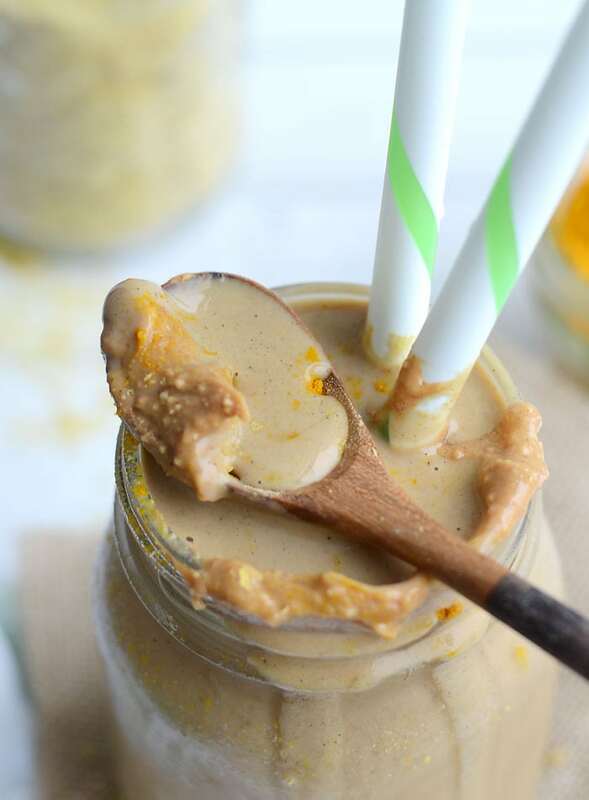 Nutritional yeast in a peanut butter smoothie… oh my gosh! I am literally going to the kitchen as soon as I type this and trying that out. I never ever even thought about putting nutritional yeast into a smoothie. So awesome! I don’t have any experience with supplementing. I used to take a multivitamin, but I stopped doing so and feel great without it as well. Everyone is different though and I feel that supplements are fine, especially when you eat as well balanced as you do! Good luck!! Hey there I’m allergic to bananas and in most smoothies are bananas so I was wondering if you know any good replacement for it?! Could I like use avocado cause of the texture and add some marple syrup for sweetness? or what would you recommend? I just found this via Finding Vegan and am so glad I did! This may just be my dinner tonight. I’ve always been more about getting my vitamins and such from whole foods instead of supplements, but I also read somewhere that provided they are good supplements a little added help isn’t a bad thing. I was thrown for a loop in talking to a nutritionist about my diet (because I’m pregnant and my mother had concerns about it with my mostly vegan diet) when his concern for me was protein. Generally that garners an eye roll from me, but he’d listened to everything, taken notes, looked at my prenatal supplement (which was loaded with B12 – Rainbow Light is the brand and is vegan) and suggested I take it with citrus juice to help my body absorb the calcuim and B12 in it… and then the protein comment. He pointed it all out to me and I was shocked at how much I needed because I’m pregnant (not pregnant I consumed just enough). I did a lot of research into powders because the thought of all those nuts and beans made me ill. In my research I came across this study: http://labs.naturalnews.com/heavy-metals-chart-Proteins-Vegan.html and was floored by how much we all take for granted ingredient labels. I decided to go with a pea protein powder based on my comparison of the information provided – unfortunately most of the brands that were low in metals were not readily available to me and pea protein seemed to have the lowest results in general. Just something to keep in mind when picking out a powder. …and with this introduction to your site, I look forward to poking around some more! OMG, WHERE did you get that mason mug?? It’s beautiful! PS You should really refrain from the guessing game and get a comprehensive blood panel done to get some definitive answers. Fatigue can be caused by SO many things, your best bet would be to get tested to see if you’re actuallu deficient in anything. I found a 4 pack at Winners for $10! A great find!! I make basically the same smoothie! I hadn’t thought to add nutritional yeast though. (Next time!) Fantastic. I’m tickled to have found your site. All the best! I’m not a vegan/vegetarian but I have been trying to decrease my meat intake to include more plant-based sources in my diet. I didn’t know about the benefits of nutritional yeast and am so thankful to you for including that information in your blog. Will be trying this recipe soon. I was really hesitant to try nutritional yeast in sweet smoothie, but this recipe is awesome! I love that it added some savoriness to an otherwise sweet shake, not to mention the additional nutrients. This is one of my new favorite smoothies. Thanks so much for this recipe Deryn! It’s perfect! I just made this smoothie with 3/4 cup almond milk, and it is amazing! 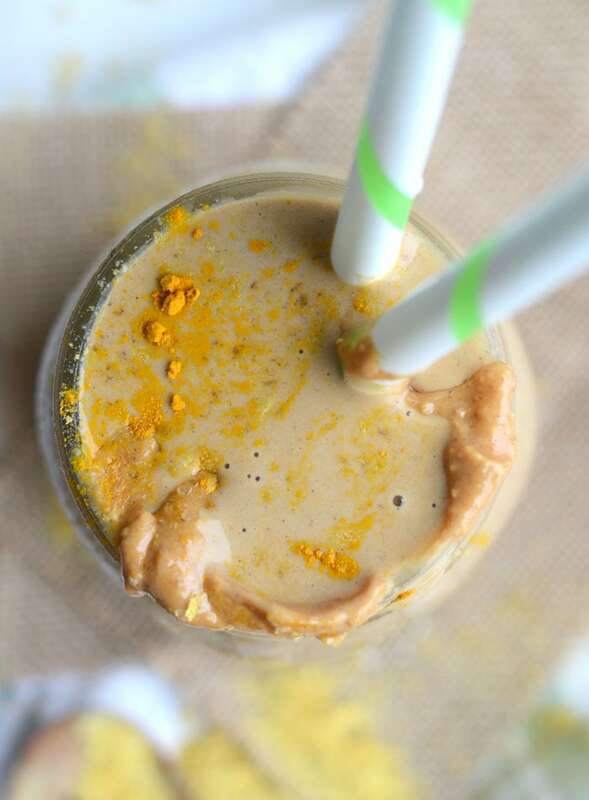 The nutritional yeast takes a chocolate peanut butter smoothie to a whole new level. Thank you, because I will be frequenting this recipe. Right? It’s so good!! Glad you enjoyed it. It’s a really good one! Let me know if you try it!